Can I have a favorite restaurant with an exception? This is definitely a vegan favorite of mine but I have a small pet peeve. I know dogs are not allowed inside a restaurant but if you have an outside area- then why not? People eat with their dogs at sidewalk cafes all over NYC. Then you go upstate to “liberal” Woodstock and you have to worry about that. I always have to sit on bench somewhere but it’s all good! They are lucky it’s one of my favorite places and that this sandwich is probably the best vegan sandwich ever! I guess I’m the lucky one! It still makes me mad though lol! This sandwich is amazing! 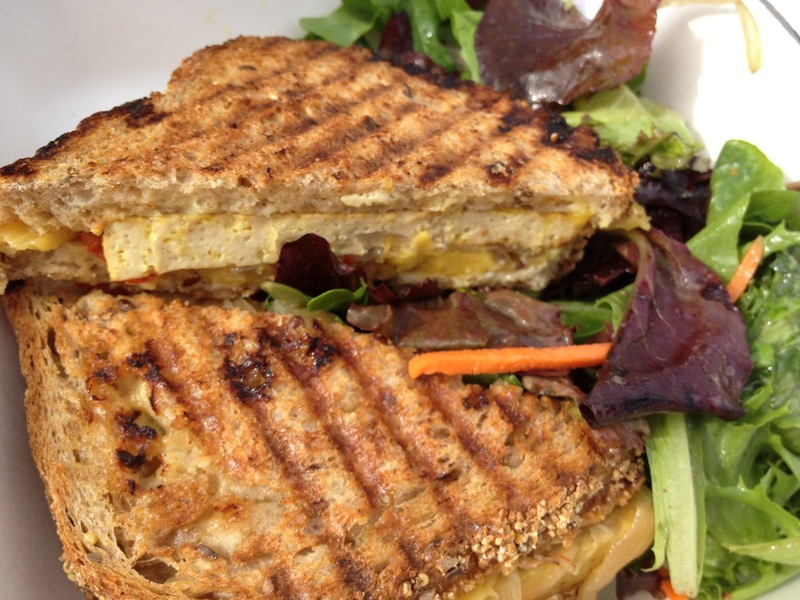 It’s grilled curry tofu mango on a special whole grain bread that they serve looking like it was made in a panini pan. I’m not sure exactly what their secret ingredients are but it’s a MUST HAVE every time!